We make it easy to purchase from Gregg Young Explorer Conversion Vans with no hassle sales and Van Conversion expertise. And what a fun mile that will be... Check out the available Chevrolet Express vans from our on-line inventory. Whether you want an all wheel drive, a hightop, lowtop or even mobility conversion vans, we have 7 or 9 passenger extended conversions available. Gregg Young has a conversion van that will fit your budget and tastes. 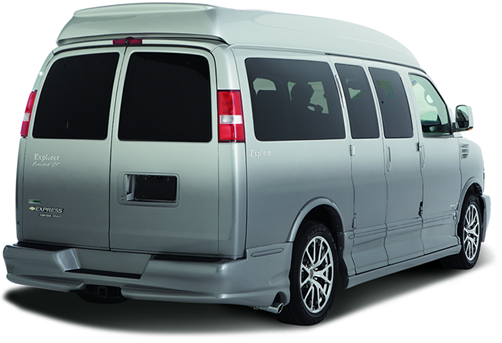 We can help pre-qualify you for your NEW Chevrolet Express Explorer Conversion in the privacy of your home or office. You can custom order a special luxury conversion to meet your individual or family vehicle needs and tastes. Whether you want a basic page or the top of the line Limited SE, our professional sales staff will help you on the road to your adventure today with our full line of luxury Explorer conversion vans. The best part is, it never costs extra to order your dream van from Gregg Young Conversion Van Cafe. Gregg Young Chevrolet of Nebraska Conversion Van Dealer takes pride in being one of the Largest Explorer Conversion Van Dealers in the United States. With a giant selection of new conversion vans always available, we have a custom conversion van that is perfect for you and your family. From luxury high top vans to mobility vans with wheel chair lifts. 2WD, AWD, or extended vans are all waiting to be delivered to you at everyday low internet prices. We specialize in Chevrolet Express Vans. Purchase conversion vans by Explorer Conversion Vans at the very best price. Here at Gregg Young Chevrolet Explorer Conversion Van Dealership we pride ourselves on providing the best vans money can buy. Drop us a line and we will send you an invoice with a cost quote. We treat the needs of each individual customer with paramount concern. We know that you have high expectations, and as a Omaha Chevrolet dealer we enjoy the challenge of meeting and exceeding those standards each and every time. Gregg Young Chevrolet, your Omaha Chevy Dealer in Omaha, Nebraska, and the surrounding metro areas of Council Bluffs, Iowa, Blair, NE, Bellevue, NE, Papillion, NE, La Vista, NE, Elkhorn, NE, Fremont, NE, Lincoln, NE, Des Moines, Iowa, Sioux City, Iowa, Lincoln, NE, Iowa City, Iowa and the surrounding areas.